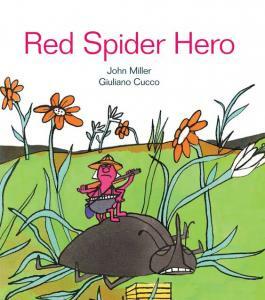 Our hero, Harry, is a young red spider, or spider mite. You may have seen these itsy bitsy critters scurrying across a light-colored sidewalk, deck or wall in the warm weather. 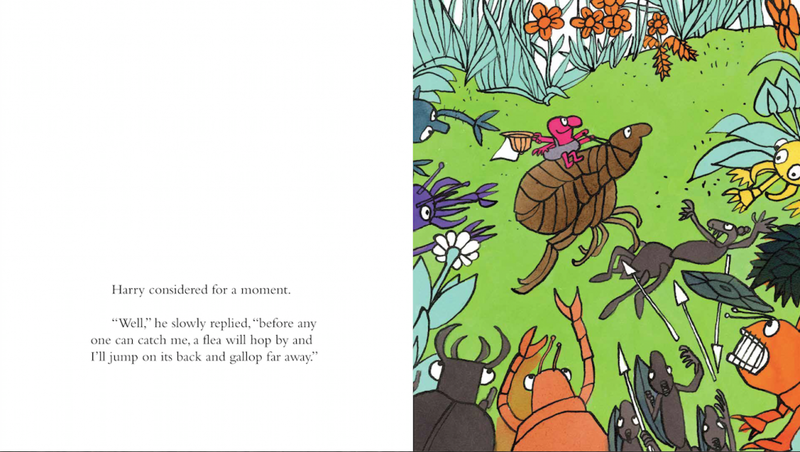 The illustrator, Cucco, brings the super smallness of these insects to our attention in one initial brilliant two page spread, mostly white, covered with minute red and black speckles. One speck is highlighted with a ring of thick black lines. This is Harry. Harry sports a beribboned folded paper hat and brown overalls. He carries a scabbard in one of his four hands, which he waves about while hollering that he is tired of being a little spider and wants to see the world. Other mites gather, curious about the ruckus. Harry’s grandfather emerges, and patiently begins to listen and reason with Harry in a most encouraging but realistic way. Harry certainly does not lack for imagination. Seeing the world may entail building a boat – no problem. Exploring the jungle? He’ll be world famous. Escaping by flea and joining a flea circus? Exciting! On and on, Harry’s dreams of adventure grow wilder and wilder as he refuses to be discouraged by Grandpa’s gentle warnings. After all, Harry wants to be a hero. Interior artwork from Red Spider Hero by John Miller with illustrations by Giuliano Cucco, Enchanted Lion Books ©2015. Cucco’s bright and quirky illustrations play cleverly with perspective, emphasizing Harry’s small stature in the vast world, while painting elaborate and imaginative settings for the tiny mite’s big dreams. Dragonflies, dandelion puffs, and well-armored articulated flea bodies are boldly drawn and richly colored. Where Obtained: I reviewed a copy of Red Spider Hero from the publisher and received no other compensation. The opinions expressed here are my own.